Ready for the contest? Here you go Love is in the air because it’s the Valentine’s month We are opening contests for 2019 with all love and hearts. Come join us for a week long Valentine’s celebration and participate in the Love da Tashn contest. Bring out the romantic in you, put on a cute smile and record a nice happy video. Time to go social and viral with this super awesome video shot with Mi-exclusive Valentine special Magic Face video frame available only on KWAI app. Love is in the air because it’s Valentine’s month! We are opening contests for 2019 with all love and hearts. 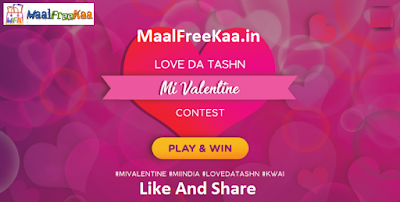 Come join us for a weeklong Valentine’s celebration and participate in the Love da Tashn contest. Bring out the romantic in you, put on a cute smile and record a nice happy video.